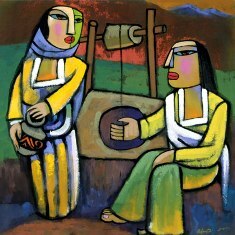 SAMARITAN WOMAN in the Gospel of John. She argued with Jesus. 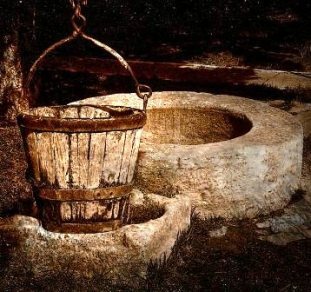 Who was the Samaritan Woman? 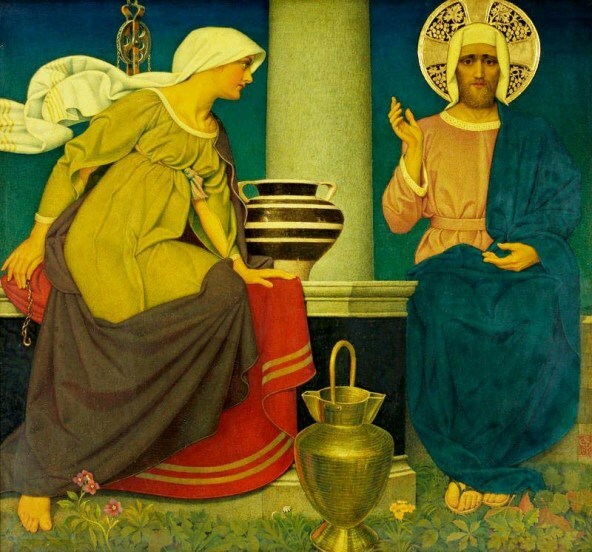 Samaritan woman – what’s the message? The Samaritan woman was a foreigner from a despised religious group, but her story made a clear statement about the role of women in the early Christian communities. 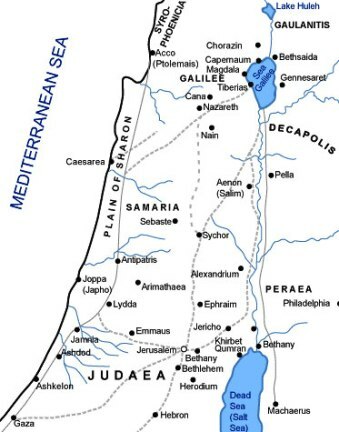 During the course of his journeys, Jesus traveled from Judea in the south back to Galilee in the north, going via Samaria – see MAPS of this area. Normally, Jewish travelers made a detour around Samaria to avoid contact with Samaritans, but Jesus took the direct route. He came to Sychar, which was a town near Jacob’s Well. There had once been a great city there. Nearby on the peak of Mount Gerizim had been a temple that rivaled the Temple of Jerusalem. See the section on the Ivory Palace at Samaria, at the Ivory Palace at Samaria, Bible Archaeology: Palaces. But all this had been destroyed before the time of Jesus, and only a village remained. Here Jesus stopped, tired and thirsty in the midday heat. His friends had gone to the town to buy food. 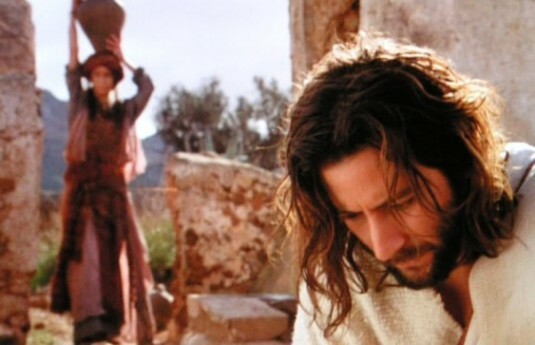 Only a Samaritan woman was there, drawing water from the well. The woman argues – with Jesus! How did she know Jesus was Jewish? Scholars presume she knew Jesus was Jewish by the way he spoke. His accent was Galilean. There may have been other members of Jesus’ group standing at a distance, and the woman may also have heard them talk. But I wonder too if she didn’t recognise his Jewishness by the clothes he wore. In the story of the Woman with an issue of blood, the woman tries to touch the fringe of Jesus’ garment, which may have been the fringed shawl worn by Jewish men – though nowadays worn usually just for prayer. 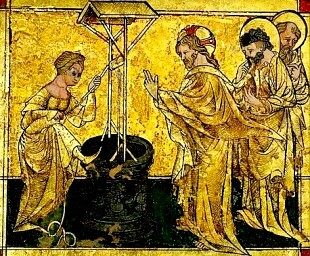 Possibly Jesus was wearing a fringed shawl when he met the woman at the well, and it was this that showed he was Jewish. Or it may be that people from particular regions wore particular designs and colours in their woven clothes – like peasants used to do in France, Belgium, Italy, etc. Jesus may have been wearing a patterned weave that identified him as a Jew from Galilee. Why was water so precious? Every drop of water used in a household had to be carried from the local well. So every day women walked to the bottom of steps cut into the rock, filled their heavy earthenware jars, returned up the steps, and carried the water home. The strong younger women of the household normally did this task, but this is not happening here. The Samaritan woman is no longer young, and since she is carrying her own water, it seems she did not have younger women in her household to do this heavy task. Jesus asked the Samaritan woman for something to drink, and here begins the longest conversation recorded between Jesus and any person. 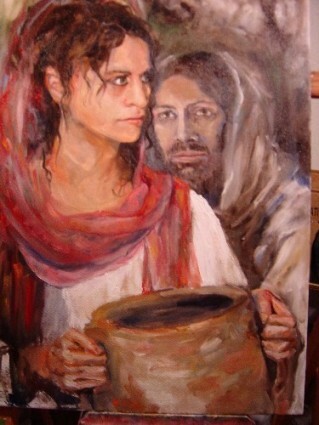 Why was the Samaritan woman surprised? It is surprising that this conversation happens with someone who was a woman, and non-Jewish. 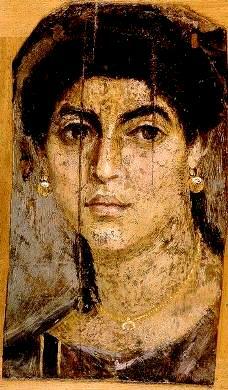 The woman herself was certainly surprised when Jesus spoke to her, because normally Jews and Samaritans did not have anything to do with each other. There had been a long-running conflict between the Jews and the Samaritans. Samaria had been the capital of the northern kingdom of Israel during the period of the divided kingdoms. 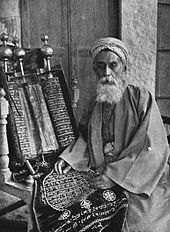 In 721BC Assyria conquered Israel, and sent most of its people to live in Assyria. The Assyrians replaced the original people with five alien tribes who resettled the area (for information on this event, see 2 Kings 17:13-34). Eventually many of the original population returned and intermarried with the five alien tribes. By the time of Jesus, Jews thought that the people who lived in Samaria were not true descendants of the great Jewish ancestors, and that their religion was not true Judaism but a mixture of beliefs. 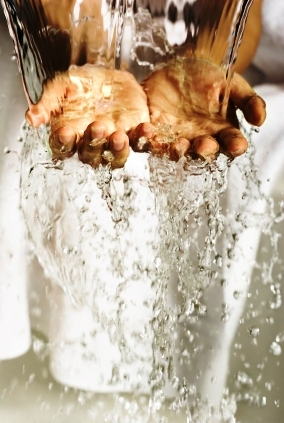 What was the ‘living water’ Jesus spoke of? Jesus blithely disregarded the ancient enmity between the two groups. He began talking to the woman about ‘living water’. The woman questioned him and drew him into conversation. Jesus explained that when people drink ordinary water, they get thirsty again. But he had water that gave eternal, not temporary, life. Naturally this caught the interest of the woman, burdened as she was with the daily task of carrying water. She asked for some of this ‘living water’. the man she was now living with, who was not her true husband, stood for the Samaritan religion. The woman understood Jesus’ meaning immediately. He was speaking about Samaritan worship in the same way that the Jewish prophets before him had done. Knowing this, the woman called him a prophet, and began asking him about differences between Samaritan and Jewish worship. She knew that the temple on nearby Mount Gerizim had been the central place of worship for the Samaritans, rivaling the Temple in Jerusalem. Samaritans and Jews always argued over which of the two temples was the true place to worship. Basically the woman was talking with Jesus about where and how you should worship God, an issue that interested her. She spoke to him as an intellectual equal, and he responded. Jesus told her that very soon none of these arguments would matter, because the Messiah was coming, and he would change everything. In fact, he said, the Messiah had actually arrived, and it was he – a momentous claim! The woman returns home – then what? Jesus’ friends returned, and were nonplussed to find him talking to a woman. Note that the disciples are surprised that Jesus is talking to a woman. They are not surprised that he is talking to a Samaritan, even though at the time that this event took place in about 30AD, Samaritans were viewed with great suspicion. By the time that John wrote his gospel, the situation had changed, and there was more concern about the inclusion of women in authority positions than about fraternization with Samaritans. The woman left the water jar she has brought and hurried back to the town. Leaving her water jar seems a trivial piece of information, but it parallels other incidents in the gospels, when various men left their everyday pursuits, abandoning fishing nets or tax collection tables to immediately respond to Jesus. The woman told everyone about Jesus, suggesting that he might be the Messiah. After Jesus’ death and resurrection, the male disciples went and told people about Jesus because they were sent to do so. The Samaritan woman did the same thing, but on her own initiative. She saw what should be done, and did it. In the meantime, the friends of Jesus urged him to eat. But Jesus refused, saying that he has eaten food they did not know about. He meant that the food we give our souls and minds is at least as important as the food we give our bodies. We shall never find happiness unless we nourish our souls and minds as well as our bodies. This was similar to the Greek ideal of a healthy mind in a healthy body, but Jesus extended the idea to give it a spiritual dimension. 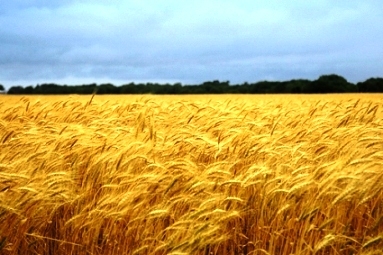 Then Jesus talked about the harvest. He was not referring to a harvest of foodstuffs, but to the many people who would believe in him. Among them were the Samaritan townspeople, who had listened to the words of the woman. Inclusion of the Samaritans among those whom Jesus favored was revolutionary, since there was bitter enmity between the Jewish and Samaritan peoples. The Samaritan woman – an apostle? The woman had persuaded them to believe in Jesus. In this, she acted as an apostle, going out to tell people about Jesus, and bringing them to him. The Samaritans invited him to stay, and he stayed for two days. Many people believed in Jesus, not just because of the woman but because they have seen for themselves that Jesus was the Saviour of the world. ‘Saviour of the world’ was one of the titles of the Roman Emperor, but at the time that John’s gospel was written, it was being used increasingly among Christians to describe Jesus. We envy the Samaritans their experience of meeting Jesus face to face. All of us have wondered what he looked like. They knew. See Modern Images of Jesus – photographs and movies that show Jesus as imagined by today’s artists. The name of the Samaritan Woman? The Samaritan Woman is never given a name. Isn’t this strange? No. This is common in John’s gospel – there are several people who are unnamed. 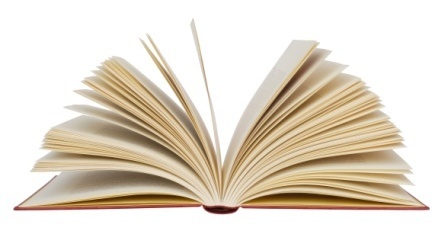 The stories about Jesus are for all people, named or not. Looking for a mediation on the Samaritan Woman?